Villamartin, Costa Blanca South, Quiet Location, Easy Reach Of Beaches, Bars And Restaurant. All inclusive price. The apartment is comfortably furnished and well equipped with everything you might need for a relaxing holiday. The balcony overlooks a peaceful park area so you can sit or eat outside without being overlooked. And for serious sunbathing there is a solarium up top. The pool here is truly one of the best in the area, with ample gardens to sit around without tripping over other people. If you want somewhere comfortable and not too expensive, where the weather is good and there is lots to do, as the base for a great holiday, then this is the place for you. We are a retired couple living in Surrey. We have had the property for several years and use the apartment as our holiday home. We try to provide everything that you might need for a holiday, and ask people to treat it with respect. Great area for a holiday. Lots of bars and restaurants. Plenty for the children to do. Good beaches. Also good for a bit of peace and quiet. There's plenty of room around the pool, even in summer, to just laze and read a book. En-suite bathroom to the main bedroom, comprising wash basin, toilet and shower. The main bathroom has wash basin, toilet, bidet and bath with shower over. There are four good international standard golf courses, all within easy reach of the apartment. Notes on accommodation: The apartment comprises two bedrooms, kitchen, dining area and lounge area, with a sunny south facing balcony. The lounge is very comfortably furnished with two large settees, coffee tables and TV. The property has satellite TV with over 300 channels, including all your favourites. Outside: The sunny balcony overlooks a peaceful park area and has a patio table and 6 chairs, for dining al fresco or a quiet glass of wine and a good book. Breakfast on the balcony is a must. You can smoke on the balcony (but not inside please) and ashtrays are provided. There are sun loungers in the apartment for use round the pool or gardens, or you can get away from it all and do a bit of sunbathing up on the large communal roof solarium. The beautifully maintained communal pool is 100 m from the apartment and has extensive grassed areas for sunbathing, with shaded areas for when you need it. There is a shallow pool for the children and the whole area is secure, which is ideal for families. Also within easy reach are numerous bars, restaurants and shops. Food shopping is easy with two large supermarkets nearby. A brand new, very large shopping mall has just been opened 5 minutes drive away. Utility Room: There is no utility room, but the apartment has everything you will need for a relaxing holiday. Cleaning / Towels / Linen Clean towels and bed linen are provided prior to arrival. Please note, price includes air-conditioning and clean and laundry after departure English-speaking representative on hand to answer any questions. Own beach towels are required. Other: The balcony overlooks a peaceful park area and has a patio table and 6 chairs, for dining al fresco or a quiet glass of wine and a good book. Breakfast on the balcony is a must. You can smoke on the balcony (but not inside please). Ashtrays are provided. Property in a nice quiet location. Definitely need a car to visit nearby beaches, restaurants etc. 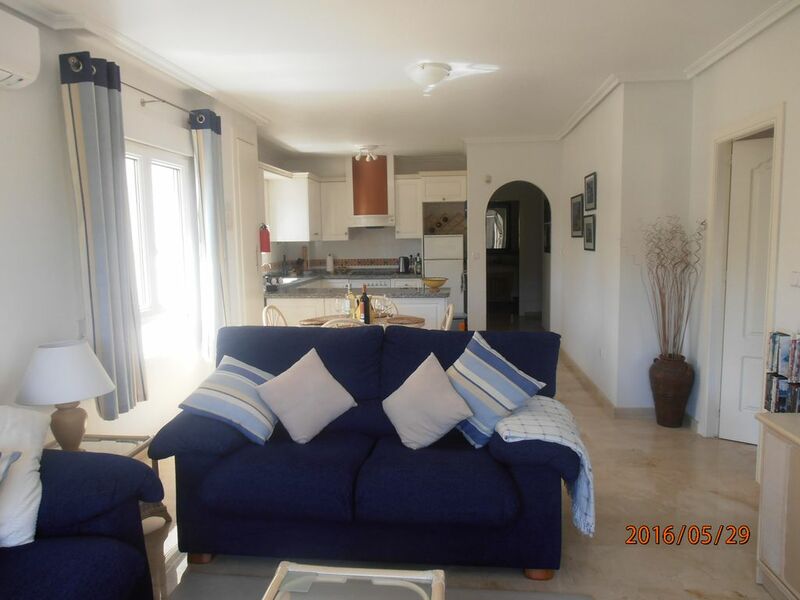 A beautifully maintained and stocked apartment in a quiet area with a large communal pool, the property is a credit to the owners, spotlessly clean with everything needed for a great break. A fabulous, well maintained and fully equipped apartment in a lovely, quiet location. This apartment is a credit to the owners, it is beautifully equipped and maintained and we could not fault it in any way. Situated in a quiet area, but very accessible to restaurants and shops. The apartment was wonderful, it has everything and more you could possibly need or want of a holiday home. On arrival the apartment had been cleaned and prepared to a very high standard. There was immediate essentials in the fridge/freezer so if our flight had been delayed we had some privisions. We stayed for three weeks in total. Meals in were easy to prepare and it is so lovely to sit on the balcony enjoy the view. Equally the distance to all the local centers is great so eating out is very easy too. The pool is wonderful. Such a lovely relaxing environment. There are a variety of local beaches within very easy reach and they all offer different activities .We will not hesitate to return. Spacious, clean, light and basically fantastic. From the moment we arrived we felt like the apartment was home. There is nothing that you could want or need that has not already been thought of. The fridge and freezer had the basic essential supplies so there was no need to rush out to the shop which after the journey was a blessing. The apartment is very comfortable and has lots of home comforts included i.e. tv and Wfi. The outdoor amenities are wonderful. The pool area is huge and everyone is so very friendly. There are lots of local places to eat and drink and within walking distance too. The new shopping centre is amazing so no need to worry if you have forgotten something as everything can be found at La Zenia. The beaches are a plenty and all offer different things. Cannot wait to return next year. Thank you guys. There are numerous clean, sandy beaches ideal for swimming or paddling, just a short drive away. The nearest beach, at La Zenia, is just a five minute drive away. The nearest airport is Murcia - San Javier which is just a 25 minute drive away. Alicante airport is a 40 minute drive from the apartment. The nearest shops and bars are a 10 minute walk, whilst there are many other shops, bars and restaurants within a 20 minute walk. Booking Notes: We prefer payment by debit card or bank transfer, as credit cards incur an additional fee. Bookings are made direct with the owners (who use the apartment as their own holiday home. Keys and directions are sent two weeks before arrival. A refundable key/breakage deposit of £50 is required before arrival, to be refunded as soon as the keys have been returned and the property inspected by our English speaking representative. Changeover Day: Saturday changeovers are preferred, but we can be flexible. Please ask if you want other arrival and departure days. Timing of arrival and departure can also be flexible. Minimum booking period is one week. Maximum stay one month. Notes on prices: Prices include cleaning and laundry, and use of air conditioning. I.e. nothing extra to pay while you are there.